Looking for an Israel tour package that suits you? Create your personalized Israel itinerary around your preferences and enjoy guided sightseeing of top unmissable sights of Tel Aviv and Jerusalem with local pros. Set off on a day trip to the remarkable Israeli towns, boasting unparallelled holy sights - Caesarea, Nazareth, and Galilee. Best location hotels, only smart connections, as well as private airport transfers are already part of the package. After breakfast at the hotel, meet your guide-driver and start your 8-hour day tour to the old town Jaffa, one of the ancient port cities in Israel and the Mediterranean basin. Jaffa city is associated with Jonah, Solomon and Saint Peter as well as the mythological story of Andromeda and Perseus. Together with your guide-driver, you stroll along the alleys of Old Jaffa, see the sculpture "floating orange", pass by the House of Simon the Tanner and the 19th-century St Michael Greek-Orthodox Church. Afterward, you arrive at the main Plaza of Jaffa and visit the Franciscan St. Peter’s Church, built on the remains of a Crusader Fortress. Then you continue to the flea market before you arrive in Tel Aviv and have a lunch break. On the way back to Tel Aviv you also visit Neve Tzedek - the first Jewish colony outside of Jaffa. Continue with a visit to The Hall of Independence with Meir Dizengoff sculpture in front. Inside you have a 1-hour guided tour unveiling the history of Israel birth. Following the tour you may stroll along the Carmel Market, Nahalat Binyamin* crafts fair of local artists and Rabin Assassination site together with you guide-driver. Please note: The Hall of Independence is closed on Saturdays. Nahalat Binyamin market works every Tuesday and Friday. After breakfast and check-out, meet your driver for the transfer to Jerusalem. Upon arrival to the hotel, you check-in and the rest of the day is at your own leisure. Alternatively, you can choose one of our carefully planned optional tours. Recommended extension: on way to Jerusalem you may add-on a full day tour to Masada and the Dead Sea. Refer to your destination specialist for more details. After breakfast at your hotel, meet your guide to start a 4-hour walking city tour of the major highlights of Jerusalem. During the tour, you see unmissable sites of interest, including the Old City, its Ramparts, as well as the historical Church of the Holy Sepulchre which dates back to 326 AD. For a taste of authentic local life, you pass the Arab Shuk Market. Next on your agenda are the Jewish Quarter and the holy Temple Mount which has for centuries been a mecca for people of different religious background. Then you walk along Via Dolorosa - the path where Jesus walked, carrying his cross. The highlight of your tour is a stop by the hallmark place of Jerusalem - Western Wall, a holy location to which people from around the globe come to pray and leave a note in the ancient stones of the wall. Last on your list is the Lions Gate, one of the eight gates in Jerusalem city walls, it is considered to be a symbol of the city and is a noted historical site. Following the tour, you may continue the exploration of the city on your own or join our carefully planned optional tours. Recommended extension: you may extend your city tour of Jerusalem and devote an extra 4 hours to Jewish or Christian thematic with the guide-driver. Refer to your destination specialist for more information. After breakfast at the hotel, meet your guide-driver and embark on an exciting 10-hour day trip to 2 Israeli cities boasting incredible Christian sites: Caesarea and Nazareth, and a northern region called Galilee. The first stop on your route is the town of Caesarea, a magnificent site with a national park where you see ancient harbor ruins and beautiful beaches. Continue to Nazareth where you visit the Catholic Church of Annunciation and the Archeological Museum, which preserve immense archaeological records, recovered during the development of the modern church. Among the trip highlights is a visit of the Synagogue-Church standing in the center of Nazareth's Old City Market. Then you have a short stop at the town Cana famous for being the place where Jesus performed “the first miracle” of turning water into wine during a wedding. Before arrival at the Sea of Galilee, which is believed to be the place where Jesus walked on water, you have a stop for lunch. Next on your list is a visit to an ancient fishing village, Capernaum, also known as "the town of Jesus". Once abandoned and forgotten, this site was excavated in the 1900's and today you may visit the Jewish Synagogue, an Octagonal Church, the Mausoleum and ornamented Greek-Orthodox church. On the way back you may also visit excavations at ancient Tiberias. 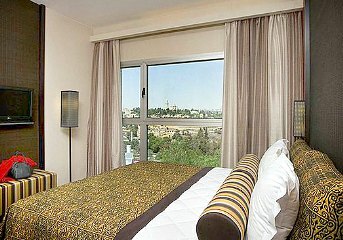 After the tour, you are taken back to your hotel in Jerusalem. Day trip to the holy destinations of Nazareth and Galilee.